"Muffy stretched, and reached out her paw as if to say, 'I've been waiting on you.'" 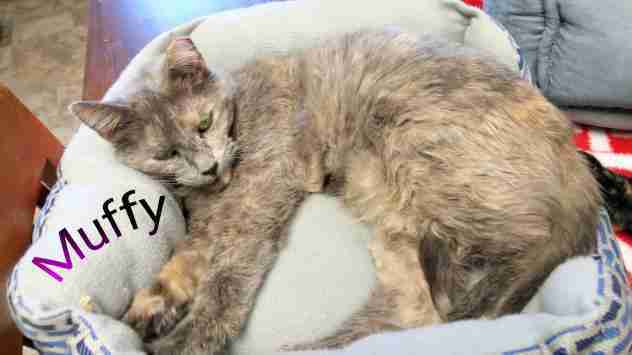 Muffy the cat has been in and out of shelters for most of her life. She has a clipped ear, suggesting she was part of a catch and release program at one point, before eventually ending up at Fayette Friends of Animals in Uniontown, Pennsylvania. After arriving at the shelter she was fostered for a bit, but then she was returned — and there she stayed, for five long years. 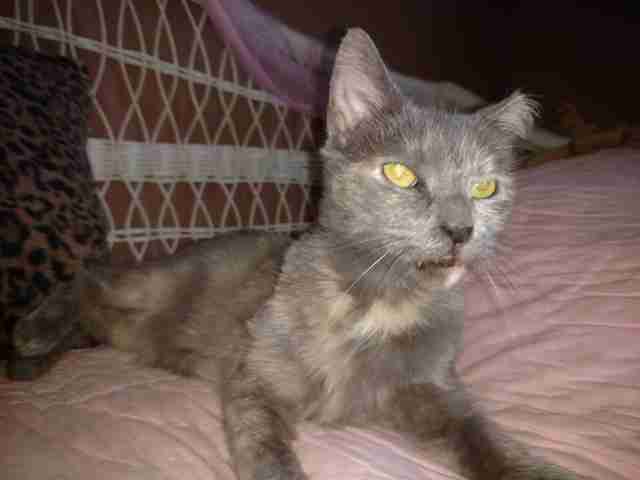 The 15-year-old cat was already a senior when she arrived at the shelter, and over the years, seemed to accept her fate as a forever resident. 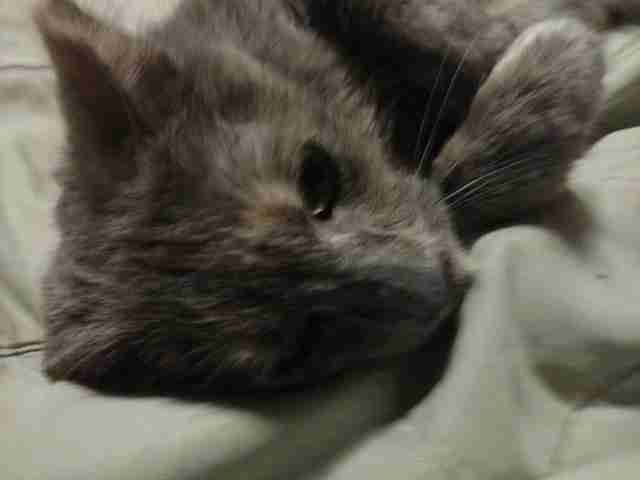 She got along well with the other cats, but was always quick to snag a free bed in the cat room so she could relax and observe in peace. The shelter staffers were worried Muffy would never find a family — until one day, when someone finally noticed her. Scarlett Wable was visiting the shelter with her children, who were delivering donations they had collected, when the staff offered them a tour. When they entered the cat room, Wable spotted Muffy, curled up in one of the coveted cat beds, and immediately inquired about her. 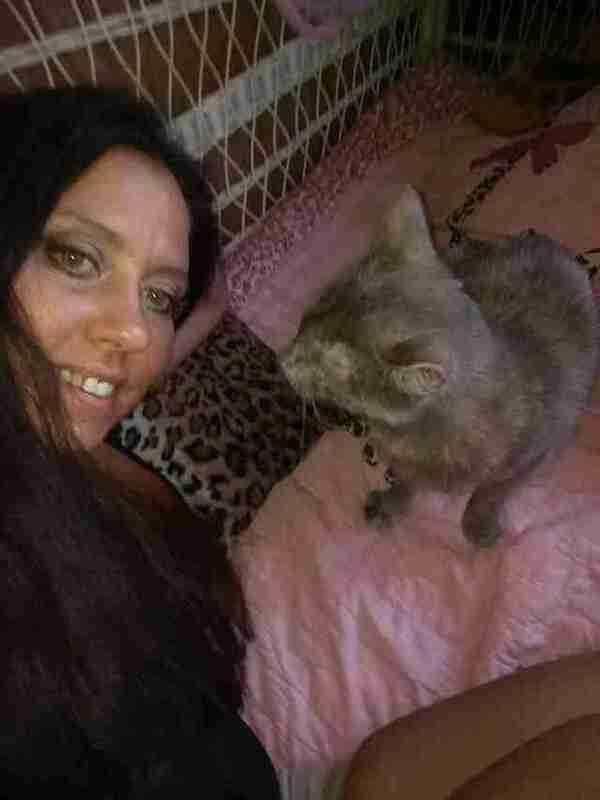 Muffy immediately started purring when Wable went over to pet her, and even though she felt a strong connection with the senior cat, she did not apply to adopt her that day — as she already had seven cats and a dog waiting for her back at home. A few months later, Wable returned to the shelter to pick up some volunteer applications, and once again visited Muffy in the cat room. Knowing that she was still there, living out her golden years in a shelter rather than a loving home, was too much for Wable to bear. That night, she went home and talked to her family, and together they concluded that everyone deserves a family. And so they decided that Muffy had to be theirs. Wable and her son went back to the shelter, and immediately went up to the cat room to see Muffy — who somehow seemed not all that surprised to see them. Wable filled out an application, and a few days later it was approved. Muffy officially had a family. On the day that Muffy finally got to leave the shelter, staff members came out to say goodbye and wish her well, and they cried tears of joy that their long-time resident was finally going home. When Wable asked about Muffy’s adoption fee, the staff told her that the fee had been waived. They were just so happy for Muffy, and so grateful to Wable for being the person to finally notice her. 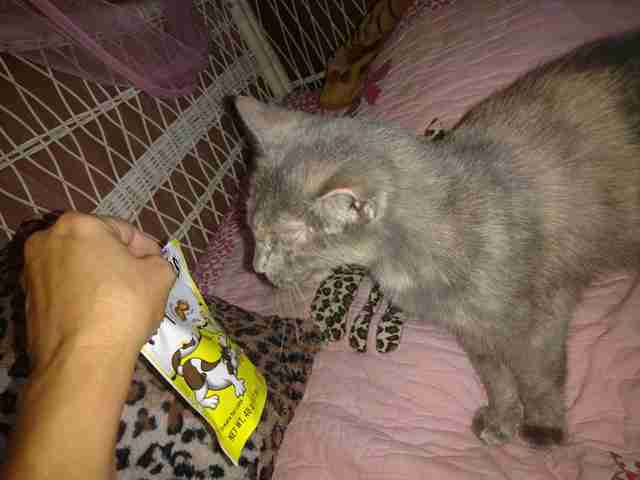 When Muffy arrived in her new forever home, her mom had her favorite treats from the shelter all stocked and ready. She brought her up to her very own room, where she could hang out and get used to her new surroundings before venturing out into the rest of the house, and it wasn’t long before Muffy was completely comfortable with everyone in her new family. 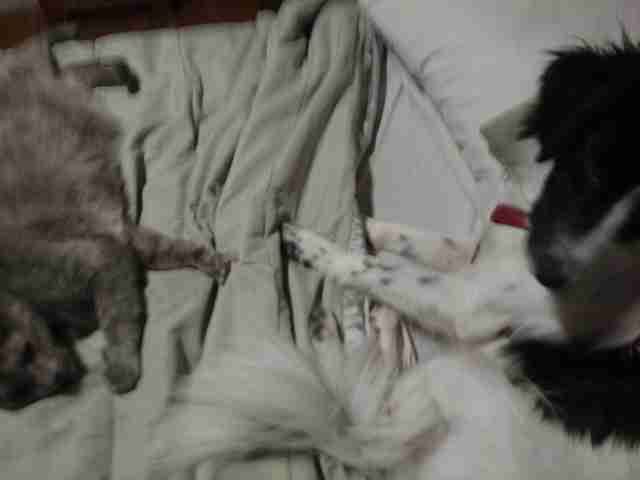 Muffy loves all seven of her new cat siblings, and has even become best friends with Khaleesi, the family’s border collie mix. She adapted very quickly to her new home and seemed to know that this is where she was meant to be all along. “She loves scratching up my daybed cover, sleeping on a huge pile of pillows, running like she is on fire through the house, sleeping comfortably near the air-conditioning vent on the back of the couch and long, leisurely strolls across my bed each night as I scratch her back and neck,” Wable said. 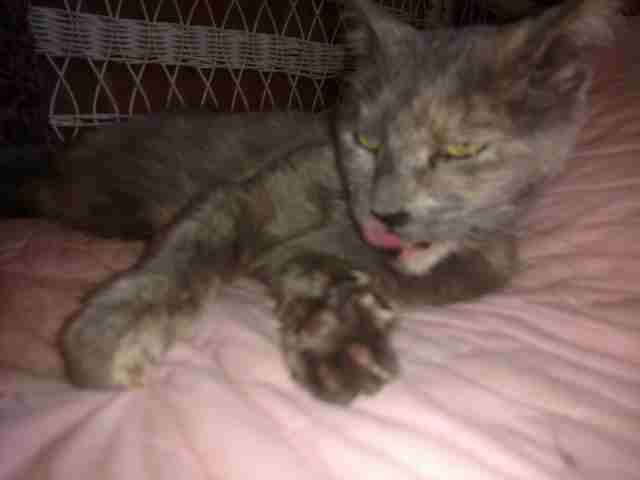 Muffy was such a loved member of the Fayette Friends of Animals family, and so Wable has been sending the staff frequent updates on how she’s doing in her new home. Each and every one of them is overjoyed to know that Muffy is thriving with her new family. “Everyone who knew her well there over the past nearly five years loved her, and were moved to tears knowing she would live out the rest of her days with her very own family,” Wable said. 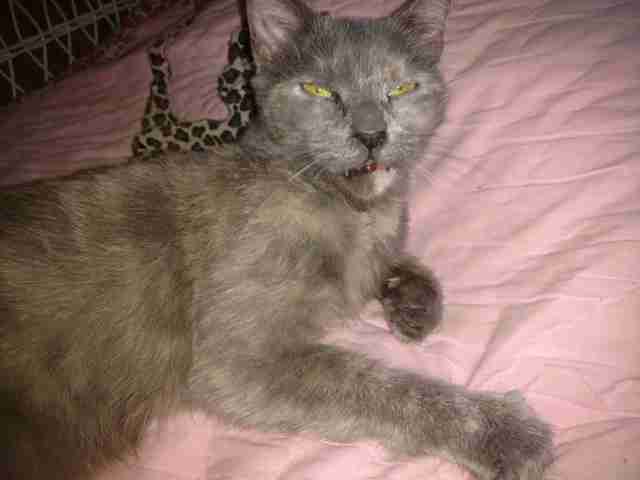 If you’d like to help other cats like Muffy find their forever homes, you can donate to Fayette Friends of Animals.